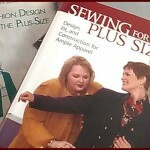 Whenever I find a resource for plus size patterns, I like to let you all know about it. That’s not to say that some of you don’t already know, but just in case, I don’t mind sharing. I stumbled across this Web site by accident while looking for something else. (Isn’t that how it always happens?) They have royalty free digital patterns for individual and commercial use. 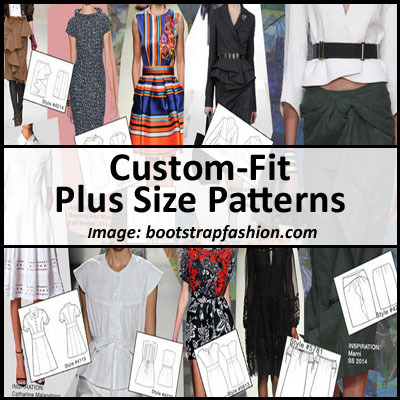 If you’re trying to start your own pattern/fashion clothing line or you just want custom-fit plus size patterns but don’t want to draft them yourself, bootstrapfashion.com may be an option for you. You can save your measurements in their system and whenever you order future patterns they always give you the option to use your saved measurements. 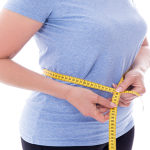 The styles they offer are based on fashion runway trends and while some may not be suitable for the plus size figure, they do offer a lot of styles. They even have a gallery of customers showing off their creations, which includes a small number of plus size women. The patterns costs $10 $2.49 and can be printed on your home printer or a plotter. So, for those of you who would rather eat rocks than draft your own custom-fit plus size patterns, this is an inexpensive way to have it done for you. And while no one can guarantee you a perfect fit, anything that eliminates multiple or complicated alterations is definitely a plus! 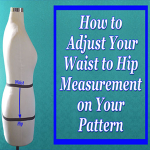 I have a young lady that has a medical disorder, and she is in a size 4to5X, her waist is larger than my tape, how do I inlarg e my patterns, for this , she has no bust, , there is no shape to her, just straight down. 1. You would have to grade your patterns to her size. This could get complicated, depending on the style of the pattern and the size you’re starting with. But if you have the patience and time, it’s doable. Threads Magazine has a quick reference guide for grading that you can find here: http://bit.ly/2CDeFNw. 2. Use a pattern that’s closest to her size. 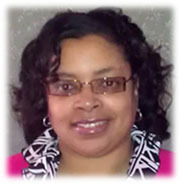 Connie Crawford sells plus size patterns in sizes 1X-6X. They’re very basic so they can be used as a sloper to create more styles. You can find them here: http://bit.ly/2CErirA. She also has a book about grading, which you can find here: http://bit.ly/2CDpJKf. I hope this helps. I know the young lady will be happy to have clothes that fit and are comfortable. This is a great thing you are doing for her. I found this website the other day and downloaded one of their free skirt patterns as a trial (the promise of making a pattern specific to my measurements seemed too good to be true.) I haven’t made the skirt yet, but I am looking at some of their other patterns as possibilities if the skirt works out. My main gripes are that the instructions seem a bit vague in parts, and there’s no indication of difficulty level on the patterns. I’m a beginner who’s starting to feel a bit more confident, but still likes to be reassured sometimes. I thiiiiink that I’ve got a good enough grasp on my skills to be able to look at a pattern and truthfully judge whether it’s something I can handle, but I also worry that I’ll always pick the “easy” patterns instead of taking a risk on something that might be a little bit of a challenge. I hope the skirt pattern works out for you, Tanya. Please don’t feel like you have to take risks right away. You can take baby steps if you want to. 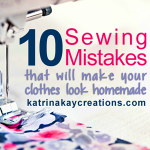 And using muslin or inexpensive practice fabric is always a good idea so you don’t mess up your good fabric if something doesn’t work out. Thanks for sharing this source. I have to make so many adjustments. Having a custom pattern should save so much time. You’re welcome, BJ. I hope their patterns are a great fit for you. You’re welcome, Kerry. Thanks for stopping by. Hi Rudina, if you Google free sewing patterns or free plus size sewing patterns, you may find the kind of patterns you’re looking for.